Intel Corporation’s chief product officer today described how its low-power processors, starting with the company’s 4th generation Intel Core processor family available next year, will set a new standard for mobile computing experiences and innovative Ultrabook, convertible and tablet designs. Speaking at the Intel Developer Forum in San Francisco, David (Dadi) Perlmutter said Intel reduced the platform idle power of its 4th generation Intel Core processor family based on the next-generation “Haswell” microarchitecture by more than 20 times over the 2nd generation while delivering outstanding performance and responsiveness. 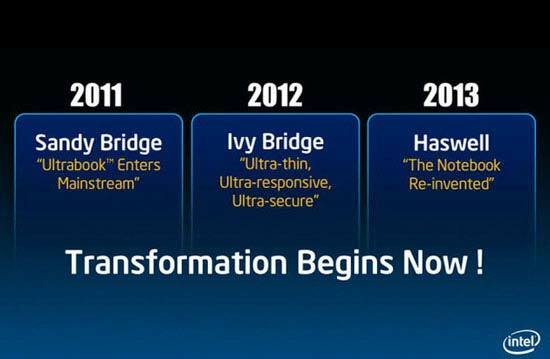 He also said Intel will add a new line of even lower-power processors based on the same microarchitecture to its roadmap starting in 2013. Both new products underscore the company’s focus to aggressively drive power consumption down to enable longer battery life and a wave of new, more mobile designs, while delivering ever-increasing processor, graphics and media performance. 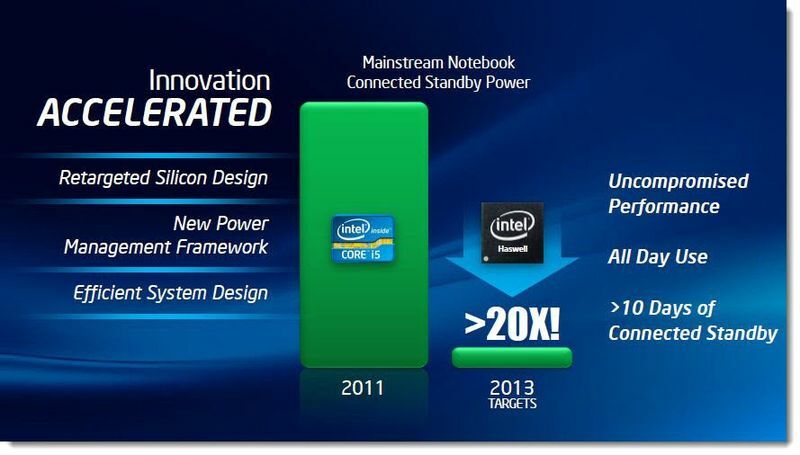 When the company’s 22 nm 4th generation Intel Core processor family comes to the Ultrabook and other PCs in 2013, it will bring Intel HD graphics support, new instructions for faster encryption and performance, new hardware-based security features and low-power processor sub-states to enable longer battery life. To spur even more innovation in mobile computing, Intel’s new low-power chips based on “Haswell” microarchitecture will broaden the company’s mobile roadmap, initially operating at about 10 watts to enable thinner, lighter Ultrabook, convertible and tablet designs with better performance and battery life. Turning his attention to the full mobility spectrum, Perlmutter detailed how Intel delivers the best choices for every mobile experience. Coming soon, the next-generation Intel Atom processor (codenamed “Clover Trail”) is a new system-on-chip (SoC) architected specifically for Windows 8. Based on Intel’s 32 nm process technology, it powers lightweight tablets and convertibles, and includes outstanding battery life and always-on technology in sleek designs. “We believe Windows 8 on Intel architecture will deliver the best experience, performance and compatibility across computing platforms,” he said. The personal computing experience is shifting to one based on perceptual computing where devices will take on human-like senses to perceive the user’s intentions, according to Perlmutter, adding that Intel is driving these capabilities across Intel platforms both now and into the future. Perlmutter invited the developer community to work with Intel to bring the next wave of perceptual computing capability to Intel Core-based platforms with the release of the company’s first Intel Perceptual Computing Software Development Kit (SDK) beta. The SDK, targeted for release early next quarter, will enable hardware and software developers to bring gesture interaction, facial and voice recognition, and augmented reality to life on existing and future Intel Core processor-based Ultrabook systems and PCs. Perlmutter talked about progress made to bring voice recognition to the Ultrabook while showing a system running the Nuance Dragon Assistant Beta optimized for Intel Core processors. Dell plans to make the Dragon Assistant Beta available in the United States next quarter in its Dell XPS13 Ultrabook.